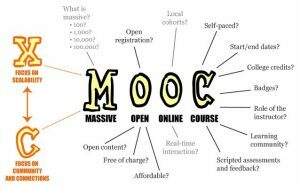 A Massive open online courses (MOOCs) is an online courses aimed at large-scale interactive participation and open access via web. In addition to traditional course materials such as videos, readings and problem sets, MOOCs provide interactive user forums that help build a community for the students, faculties and teaching assistants. MOOCs evolved from the open educational resources (OER) movement as a way to connect open access digital materials to networks of learners and may be considered a continuation in the development of distance education. The term ‘MOOC’ was originally articulated by Dave Cormier (University of Prince Edward Island, Canada) to describe a course developed by George Siemens and Stephen Downes on ‘Connectivism and Connectivity in Knowledge’ in 2008. MOOCs provide learners with a flexible means of studying (asynchronously via mobile devices and at their own pace) and provide access to international experts and diverse communities of learners. MOOCs, in particular, foster self-directed learners who are able to use digital tools, learn within networks and develop a mind-set of continuous learning. MOOCs have evolved as a new paradigm of digitized open education which could be implemented in a massive domain of India. In a developing country like India where significantly large number of people live in rural areas and cannot afford quality education, MOOCs can definitely be considered as game-changer. Many Indian students and working professionals have now started embracing MOOC platforms to develop deeper knowledge in their respective subjects. Considering the popularity and relevance of MOOCs, Government of India has also launched an indigenous platform, SWAYAM. SWAYAM (Study Webs of Active Learning for Young Aspiring Minds) is basically an integrated MOOCs platform for distance education that is aimed at offering all the courses from school level (Class IX) to post-graduation level. The platform has been developed collaboratively by MHRD (Ministry of Human Resource Development) and AICTE (All India Council for Technical Education) with the help of Microsoft and is capable of hosting 2,000 courses. It may be noted that MHRD has also launched 32 DTH (Direct-To-Home) educational TV channels called SWAYAM Prabha. The DTH channels would broadcast education content (created on the MOOC platform, SWAYAM) to students 24X7. The MOOC platform has been launched by the government with the objective of taking “the best teaching learning resources to all, including the most disadvantaged,” informs the official website. • Course type and duration: There are two types of courses offered through SWAYAM – Credit and Non-Credit. Credit course is a course taught for at least one semester as part of a subject. Non-credit courses include courses such as awareness programme and specific skill-set training, which are not part of any set curriculum. Such courses can be of shorter duration, usually ranging from two to four months. • Course components: Courses hosted on SWAYAM are available for students in four components: video lectures, downloadable/ printable reading material, self-assessment tests through quizzes and tests, and an online discussion forum for clearing doubts. • Eligibility: Online education courses offered through the portal of SWAYAM (swayam.gov.in) can be accessed by anyone, anywhere, any time. • Course fee: Courses offered via SWAYAM are free of cost for residents of India. However, in order to obtain certificate for a particular course students need to pay a nominal fee. • Certification: Students who wish to obtain certificates for their courses need to get themselves registered on SWAYAM portal. Also, certificates are awarded to students only after successful completion of the course. • Credits: At the end of each course, students will be assessed through a proctored exam. Marks/ grades secured by students in the exam can be transferred to their academic records. To implement the same, UGC has issued UGC (Credit Framework for online learning courses through SWAYAM) Regulation 2016 recommending universities to identify courses in which credits can be transferred to students’ academic records.